2.5 stars. I think the book gods must be laughing at me this week. It was all too apparent that my fabulous reading streak was going to have to end sometime, so of course they decided to shake things up by giving me a few books in a row which would test my limits of patience when it came to rating and reviewing them.There had to have been at least 5 times when I was struck with the urge to slap a big DNF on this book. The first half was painfully terrible. The book's summary had me thinking that I'd be reading some sort of a cross between Sucker Punch and Shutter Island...not an insane asylum version of Fallen.The pining and longing was killing me. I wanted to throw myself into the flames along with Addy and burn, burn, burn.I love her son like he's the oxygen in my lungs, the plasma in my bloodstream, and the rapid pulsating beat of my heart.Sometimes I feel like I love him so much it aches when I'm not near him. It's like tiny pricks from a sewing needle jabbing into me repeatedly.I miss him so much that since yesterday my heart has felt like a towering inferno and there isn't any water or a fire extinguisher around to put it out.I'm burning, burning, burning. I want to burn eternally.I need to feel his touch, listen to his voice, see his beautiful face. I need it and if I don't have my chance, not seeing him will kill me.We won't even go into the passages where she talked about her private parts throbbing with need. I probably might have even enjoyed those parts if I was reading an erotica. However, in this book, the phrasing felt strangely surreal and uncomfortable. So, I think I summarized the first 2/3 of the book. Yep. Not much else happened. I'm probably being way too generous with my rating when I loathed pretty much everything up until the end. But of course...the last 50 or so pages had to come in and turn things around. We went from burn, burn, burn, to turn, turn, turn. I did guess what was coming, but I was honestly happy to see these events come into fruition. Hot damn, now we have a story to work with.Some could say that the earlier character behavior did, in fact, lay excellent groundwork for the direction that the story took. Okay, I'll go with that. It might very well have been necessary to show Addy's intense feelings for Damien. We won't really know until book 2 how this is all going to play out. However...I will still argue that there are ways to show extreme love without having to resort to flowery sentiments. Or at the very least, just reign it in a bit. 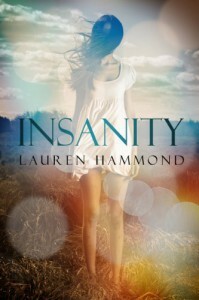 I didn't even include Damien's side of the faux-Shakespearean drivel.Should you read Insanity? I would say it depends. If you're less likely to be upset over love ramblings, then I'd say go for it. There is a story hidden among the things that jump out at you. It just doesn't become obvious until little clues at the end start to pull out previous happenings.1 star for first 2/3 of the book. 4 stars for the way it ended. I'll be checking out the second installment because I think the doors have been cracked wide open to all sorts of creepy possibilities.